When docking the ship the ship is slightly trimmed by the stern so that the stern block touches the stern frame first. This is necessary to steady the ship by locating the stern on the block. The stern side is chosen since the stern frame is very strong and can resist the strong single reaction occurring at the instant the stern block touches the stern frame at the coffin plate or bottom of the stern frame. Almost all modern ships have aft machinery space and when floating in light condition they trim very badly by stern. This heavy stern trim has to be corrected by filling the forepeak tank sufficiently to result in a slight trim by stern. Hence it is not correct to state that the ship should be completely empty to make it light. This was true for older ships which had mid ship machinery space and in light condition they floated on an even keel. Hence all modern ships with aft machinery have their forepeak tanks filled sufficiently to result in slight stern trim. In some cases the forward ballast tanks may also be filled up to correct the trim to give slight aft trim. Almost all major shipyards use Graving docks or floating docks for dry docking and the procedure adopted in both cases is same except for a minor adjustment which will be explained later. 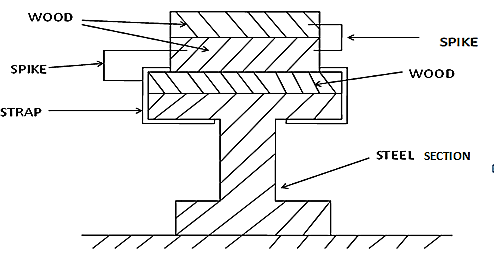 An explanation with derivation of the stern reaction and its relationship with trim is demonstrated to show the importance of limiting the stern trim. The above sketch shows a ship docking and at the moment when the stern has touched the stern block. The ship has taken a slight starboard list, maybe due to a light squall. Where (∆ –R) is the residual buoyancy. The above equation is called the critical condition equation when R occurs and the position of M (metacentre) in the floating condition, can go below on the transverse centreline, or climb up on the centre line , depending on location of residual buoyancy. The condition for safe docking ie the ship does not slip off the blocks, is that the critical metacentric height at this instant is still positive (GM is still positive). The term ∆ * GK is called the upsetting moment and the term (∆- R)*KM is called the restoring moment. If the upsetting moment is greater than the restoring moment the ship will slip off the stern block. If the upsetting moment is less than the restoring moment the ship will become upright. In the critical condition both these terms are equal . At the critical condition there can be a drop in the position of M resulting in a lower GM, or a rise in M resulting in a lower GM , however with a virtual rise of G.
We will now refer to the profile view on the right hand side. The trimming moment is given by R*L/2 approximately. The trimming moment is given by R* distance of centre of floatation from aft perpendicular and varies with draft. The variation is not much and is within a very small distance from the mid ship either forward or aft of the mid ship. From the above derivation we observe that the stern reaction increases proportionately with stern trim. As a general convention or thumb rule the stern trim is limited to 0.5 metres for ships of length up to 200 metres and 1 metre for ships above 200 metres whilst docking. In addition to the trim limitation the shipyard sets the blocks with a declivity to suit the trim and this ensures that all the blocks come into contact at the same time avoiding any condition for a stern reaction to be formed. With the declivity in place , a slightly higher trim will result in a small stern reaction and can be neglected. In graving docks declivity is arranged (Refer to Fig4) .In floating dry docks declivity is accomplished by trimming the dry dock suitably and then correcting it to even keel after the ship has completely seated on all the blocks. . The danger of excessive trim results in a dent occurring in the area adjacent the stern frame bottom and coffin plate. As the water is being pumped out of the dry dock the stern reaction increases at the same rate in fall of draft and it could be high with depth of water in the dock falling fast especially towards the completion of pumping out water. The high rate of increase in the reaction force is like an impact and hence this can be called a silent impact. In the case of floating docks , the effect of high stern trim will result in the stern blocks being pushed behind, and that is because of trim of the dock itself. The author had witnessed such a situation at Chennai in Chokani ship yard when they were in operation . A ship owned by Essar shipping was being docked at no2 floating dock. During docking operations it is customary for the Yard Diver to carry out an underwater check at the time of docking to ensure that the ship is proceeding correctly to seat itself on the blocks. When he went down he observed that as the ship was attempting to make contact aft a few blocks on the aft side were pushed out from their positions leaving the ship without supports on the aft side. The docking was therefore abandoned, and the ship instructed to move out and come back after correcting the trim. (2) The ship should always be upright during docking and undocking. This requires monitoring of the clinometers during the docking operation and take suitable corrective action by transferring water or bunkers from port to starboard or starboard to port as required. No water should be pumped in or out of the ship as that would affect the selected displacement of the ship. (4) Do not exceed the recommended stern trim. (5) Ensure all bilges and bilge tanks are dry and there is no unaccounted water on board . If F.W. is consumed during the stay in dry dock, the consumed amount must be replenished into the tank before undocking. A very common occurence is that the forepeak tank is normally drained out for purposes of survey. Hence before undocking, the bottom plugs are re fitted and the forepeak tank filled up to the original sounding prior to undocking.. The blocks are made of steel I section with one wooden standard thickness block strapped to it Additional wooden blocks can be fixed on it to suit the given height required using steel spikes to fix them so that they do not float when water is filled into the dry dock. This system provides for easy removal and refitting of blocks as required after the ship has docked. (Refer to Fig below).